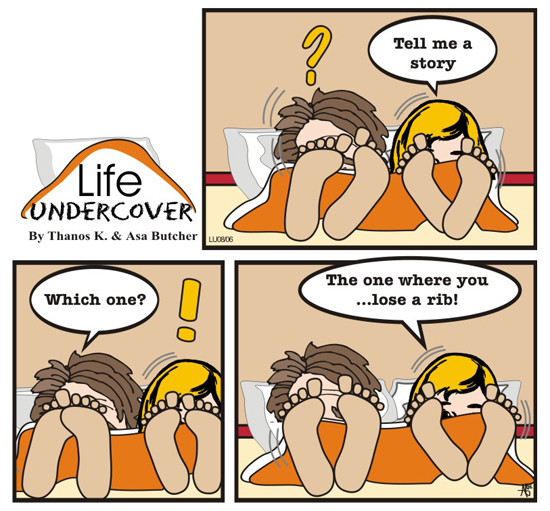 He: The story is this: Eve indeed was created out of the rib of Adam. She was not created from a bone in his foot so that she would be under man. She was not created from a bone in Adam’s head so she would be above man. Eve was created from a bone in Adam’s side, his rib bone, so that she would be at the side of man and be called a helpmate. And so it is that Adam and Eve stand side by side in a mutual partnership of love and serving. She: Sounds like marriage to me. He: indeed. How else do you think civilization began? He: via language and myth (the poetics of the mind), the burial of the dead (religion), marriage (first Primitive society).